Sky + HD 1TB review | What Hi-Fi? Sky has been the TV provider with the most HD content for years now, and that shows no sign of stopping. Every time a rival adds a couple of new HD channels, Sky adds a load more. And now it's launched 3D, too – if you subscribe to the top package you'll get it for free. However, as the quantity of HD content rises, it's easy to fill the standard box's 160GB hard disk. But take a look at this one. Not only does it boast a more compact and premium-looking chassis, it also has a 1.5TB hard disk onboard. Confused why it's called a 1TB box if it's got a 1.5TB HDD? It's because 1TB of space is entirely free for you to use for recordings, while 400GB is used for an extended Anytime service and the remainder contains the operating system. What's 1TB in recording terms? A whopping 240 hours of HD or 740 hours of standard-def content, that's what. With that sort of space, your days of deleting shows in order to make space for the next episode of True Blood will be over. Now you can have your HD cake and save it as long as you like before eating it. The Anytime service is in on the game, too. It's now more than twice the size of the standard box's entire hard disk, and that means that the quantity of content has leaped – and that even more of it is now in hi-def. And that monstrous amount of content is too little for you, you can connect your 1TB to your Sky broadband (other ISPs will be supported at a later date) to download even more TV shows and movies. Admittedly these are just standard-def with stereo sound, but for sheer quantity it makes the Sky service simply unbeatable. There are a couple of other neat touches, too. Like the main unit, the remote has a new, glossy finish, and the rear panel also has side-cheeks that extend a few millimetres back behind the main panel to ensure you don't crush the cables against a back wall. Game-changing features? Certainly not, but thoughtful, none-the-less.Picture and sound quality are as good as ever: the 1080i HD pictures are crisp and vibrant, while standard-definition content is generally very clean and stable. Compatible broadcasts are accompanied by 5.1 sound which, while very decent, is delivered, disappointingly, via optical cable, rather than down the same HDMI cable as the picture. Overall, though, it's a great step forward without any sacrifices. Except, that is, where price is concerned. 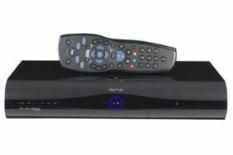 A standard Sky+HD box is now free to new subscribers, whereas the 1TB model will set you back £250. Dedicated tweakers might point out that a 1.5TB hard disk drive costs considerably less than that now, but for us the convenience of getting all that extra HD content with the Sky+HD 1TB box makes it more than worth the extra cash.